I met Roscoe from the perspective of a potential adopter and wanted to provide a little note on my experience with him to help him find his perfect home! This was my first time out to SAFE and my first‐time meeting any of the horses that are available, and I was really impressed with the facility, employees, and the care and condition of all the horses. I was greeted by Terry on my arrival, and after filling out a quick waiver we went to meet Roscoe! Upon entering his stall, I was immediately met by a sweet, interested little bay face, ready to be haltered. Roscoe stood tied in the arena with other horses with no problems while we groomed, picked up all his feet, brushed out his mane and tail, and touched my hands all over him to see if there were any sensitive areas. He was relaxed and friendly throughout the whole grooming and tacking process, and I even got a few nose wiggles when I found a good itchy spot on his withers. He isn’t girthy or sensitive at all and took the saddling process with no fuss. We started out with some ground work, where I watched Terry work with him. It’s evident he’s had a good foundation here and was responsive to her cues. He quickly figured out what was being asked of him and had a good attitude about it. Terry worked him through some ground work exercises to loosen up his front and hind end, get him moving and engaged, and get his brain going. He walk, trot, and cantered on a long lead with minimal need for encouragement and did not pull away or try and rush. His up and down transitions were quick, he pays attention to his handler. He was interested in drifting out towards the arena gate while on the line (but what horse doesn’t!) but wasn’t rude and some light taps on the line kept him engaged. When we swapped over for me to work with him on the ground he was quiet, engaged, and quickly figured out what I was asking of him or made attempts to answer my ‘questions’ despite my cues being a little different from the ones he knows from his normal handlers. I was impressed with him and his attitude and had no concerns regarding his ground work. I felt confident moving to the next step of getting on him. I watched Terry ride first, and she did a fantastic job explaining what activities and exercises she used with him and illustrated areas where he is typically a little stiffer or needs more encouragement to stretch and relax. 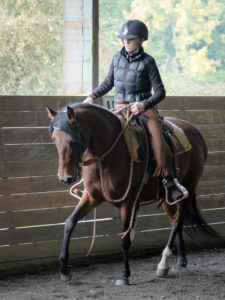 She demonstrated all 3 gaits as well as a lot of walk work, bending, doing serpentines, and moving off the leg and rein. I hopped on him afterwards and found him to be light and uncomplicated to ride. 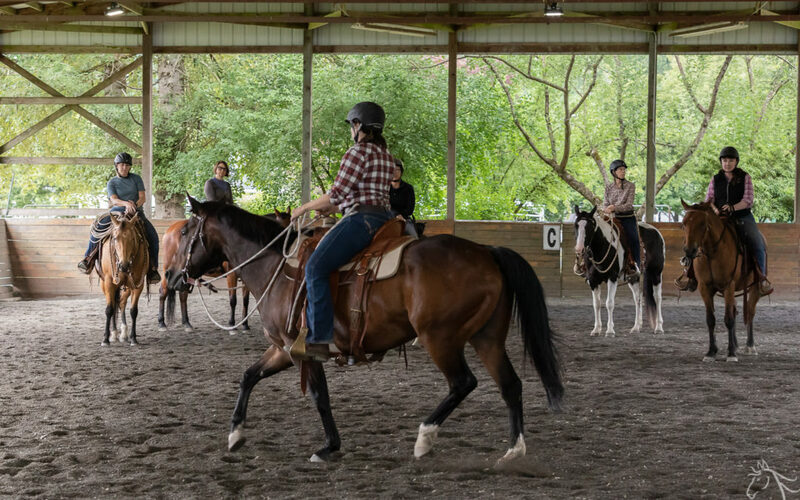 As someone with a lifelong background in dressage and English riding some of my normal cues are different than the style Roscoe has been taught, but we had no problems under saddle figuring out our communication. He moves off the leg easily into a trot and canter and was responsive to aids when I asked him to turn and stop. He did tend to want to fall out a little towards the arena gate and drift, but leg and rein encouragement put him back on the circle with minimal effort. I was able to easily sit to both his trot and his canter without having to work at it, and he stayed in the gait once I placed him there, without rushing. 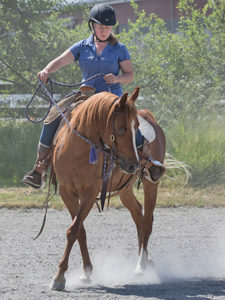 He’s got a great stop and is light in the bridle and off the leg – we were able to make turns, ride circles, and do some serpentines at all 3 gaits. 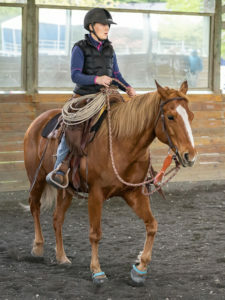 While not a “finished” horse, he has a great foundation and I felt safe, comfortable, and had a great time riding him. He felt like the kind of horse I could hop on after a long day and go for a long trail ride on without any worries! We spent a while at the end of our ride just parked watching another horse be worked, and he had no problems standing still and didn’t get antsy or try to wander away from where I had parked him. Leading back to the barn Roscoe’s ground manners were great, and he pays attention to his handler. There were a few moments where he wanted to rush back to the barn a bit and get in front of me, but just by stopping walking, asking him to back up til he was even with me, and walking forward again corrected that easily. By the third time we did it, he immediately stopped when I did, and stayed next to me with slack in the lead the rest of the way. He doesn’t rush into the stall, waited for me to turn him around, and stood by the door with me while I took his halter off. He was really social and wanted to be close by — he was all about some face and ear scratches. He does want to creep into your personal space a bit, but not in a rude or aggressive way – he seemed to just expect that I should be petting him at all times 😉 I think he’s going to make someone a really lovely partner!